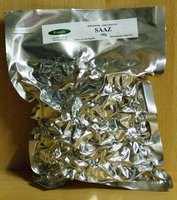 Saaz hop for use in home brewed all grain Pilsner and lager - Vacuum packed for longer shelf life. The original Pilsner Hop which is also excellent in all other types of lager. A Czech hop which is suitable for all Pilsners and lagers. It is noted for its earthy/herbal aroma and its mild bittering properties. Whilst Saaz hops are usually used in Pilsner and lager recipes and feature prominently in Dave Line's recipes for Stella Artois, Pilsner Urquell and Kronenbourg, they are also used as the late boil hops in Graham Wheeler's recipe for Fullers Discovery. Its typical alpha acid levels are 3.0-4.5% depending on the harvest, so you may need to adjust the amounts used in your recipe to ensure that you match the target EBU value.